Gov. 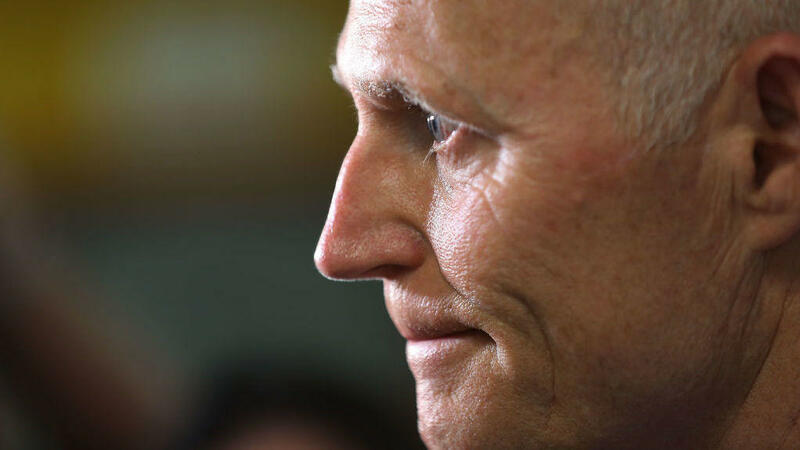 Rick Scott, R-Fla., is expected to announce his challenge to Sen. Bill Nelson, D-Fla., on Monday. Florida Gov. Rick Scott is jumping into the Senate race in Florida, challenging an incumbent Democrat and setting up what could be the most expensive Senate race in the country. Scott touted his jobs record as governor and vowed to bring that model to Washington. He also vowed to fight for term limits, saying that the culture in Washington can't be changed unless the people are. "Some say as governor, I have never fit in or played by the political rules in Tallahassee," Scott says in an announcement video. "Well, that's true. I never planned to fit in. And I won't fit in in Washington either. It's time to shake that place up. We don't need another politician in Washington. It's full of politicians, and that's why it's broken." Scott's entry into the Senate race against Democratic Sen. Bill Nelson gives the GOP a top-flight recruit with deep pockets in an expensive state, shifting the battlefield map for 2018. Scott is banking on a jobs and outsider message to help propel him to the Senate and help Republicans hold onto control of it. Even if Democrat Bill Nelson is able to win reelection, however, it will divert lots of Democratic resources to the state to hold onto it. The pro-Democratic opposition research group, American Bridge, didn't hold back in its criticism of Scott. Republicans are daring Democrats to try and pour resources in to help Nelson — something that would take funds away from the other nine incumbents running in states President Trump won. In fact, the ads started in this race in December -- before Scott even got in. Throughout his two terms in office, Scott has been a divisive figure — but one that even some Democrats admit they may have underestimated at times. Still, they argue the wealthy former health care executive has benefited from conservative headwinds in his past elections that may not be there in 2018 with a possible blue wave forming. Few people in Florida had heard of Scott in 2010 when he announced he was beginning his political career with a run for the state's top office. He ended up spending more than $70 million of his own money on a campaign that came at precisely the right time. Florida and the nation were recovering from the worst recession since the Great Depression and looking for change. It was also the dawn of the insurgent Tea Party movement, which embraced Scott as one of its own. After taking office, Scott announced plans to cut $5 billion out of the state budget. However, the event wasn't held in the state capital of Tallahassee but in front of a crowd of Tea Party supporters in Eustis instead. To cheers and applause, Scott proclaimed, "It's a budget that's designed to reduce state spending, lower taxes and hold your government accountable. This is the budget you asked for." In his first year, Scott oversaw big cuts in spending on education, healthcare and the environment. He took aim at government regulations, eliminating an agency that oversaw development statewide — something that was all done with one purpose in mind. "His thing was jobs, which he's been so consistent about almost to be one dimensional in the last eight years. Tax cuts for business to create jobs," said Mac Stipanovich, a longtime Florida Republican political strategist. And no matter what the question was, Stipanovich said Scott always had the same answer: "What time is it? Time to create jobs." Florida's economy, like that of the nation, rebounded during Scott's time in office. However, Democrats point out that real median incomes have declined during that period while the cost of living has risen. Scott took office as a conservative, with tough positions on many issues, urging for example a crackdown on immigration. In a state where a fifth of the population is foreign-born, he quickly retreated from that. In 2014, he signed a bill allowing undocumented immigrants to qualify for in-state tuition at Florida colleges. After slashing education spending, he later worked to raise teacher salaries. Scott opposed expanding Medicaid under the Affordable Care Act, but then reversed himself — not once but twice. Now once again, he opposes it. Although Scott still questions whether there's a connection between people and climate change, he's moderated on some other environmental issues. After first supporting it, he now opposes any drilling for oil or gas off the Florida coasts. Brian Ballard, a lobbyist and fundraiser with close ties to Scott, says as he's gained experience in office, the governor's positions on many issues have evolved. Ballard says Scott is "a combination of an insurgent mentality but someone who understands now how government operates, what it means to compromise, to make important principles become governing policy." Over the last year, Florida has been hit by a series of events that have tested Scott and his administration's ability to respond to crises. They included Hurricane Maria, which brought more than 200,000 Puerto Ricans to Florida, and Hurricane Irma, which endangered almost the entire state. In Irma, the state's response was marred by 14 deaths at a nursing home in Hollywood Hills where the air conditioning failed. Scott blamed the nursing home for the deaths, which he says should have evacuated residents when conditions worsened. But before the storm, Scott had given his personal cell phone to nursing home operators, telling them to call him with any problems. But the facility made three calls to the governor, all of which were unanswered, before finally evacuating residents. A similar pattern emerged after the collapse of a pedestrian bridge at Miami's Florida International University in March in which six people died. In a news conference, Scott said, "It's not an FDOT [Florida Department of Transportation] project. It's an FIU project." Afterwards, documents emerged showing the state helped choose the firm that oversaw construction and that FDOT had a responsibility to make sure the bridge was built safely. But one crisis were Scott did receive plaudits was his response after a gunman killed 17 people at Marjory Stoneman Douglas High School in Parkland this past February. At a news conference near the school, Scott pledged action — and he delivered. Working with Republican leaders in the legislature, a few weeks later Scott was able to sign a bill that imposed a three-day waiting period and raised the age to 21 for all gun sales in Florida. It was the first gun control legislation passed in the state in more than two decades, and the National Rifle Association immediately filed a lawsuit to block the new law. For Scott, it was a major achievement that put him at odds with many in his party. But some Democrats said said it didn't erase his past policy positions. "I think you've got to look at eight years though," argued Dan Gelber, a former Democratic leader in the legislature who's now mayor of Miami Beach. "All of these Republican officials, including the Governor, have been very beholden to the NRA. They've given them an outsized influence over our state. They've allowed them to create a gun culture and culture of violence." Some of the attacks Democrats are readying against the Florida governor could be familiar ones. In the 1980s, Scott helped build Columbia/HCA into the nation's largest for-profit hospital chain but later left the company amidst a federal investigation. Columbia/HCA eventually pleaded guilty to overcharging the government and paid what was, at the time, the largest fraud settlement in U.S. history. Scott's opponents brought that up when he first ran for governor in 2010 and again four years later when he ran for re-election, but the charges never took hold. Democrats will double down on that message though, highlighting his business past and shortcomings as governor with a website they've already launched, SelfServingScott.com, along with running Google ads. But even some Florida Democrats admit opponents have consistently underrated Scott's political skills in the past. "This is a guy who spends a lot of money on polling. He has a sense of where the voters are. He is a magician at manipulating the media. As he will say himself, he only says what he wants to be reported," said Democratic strategist Steve Schale. But Schale and others also argue Scott has benefited from quite a bit of political luck that may not be on his side this time. "Scott's two razor-thin wins for governor were driven by a base-first campaign strategy dependent on weak Democratic turnout and tremendous Republican enthusiasm, a constellation of events that has completely reversed itself in 2018," the Democratic opposition research group American Bridge argued in a memo last week. "This time, Scott's putative Senate bid will run into a Democratic headwind the likes of which he has never encountered and for which his political brand is totally unprepared." The Trump factor could also drag Scott down. The Florida governor was an early Trump supporter and the president has urged him to run for the Senate. If this election, as many analysts believe, becomes largely a referendum on the president, Scott's close relationship with Trump could become a major liability. Even though Trump carried the state in 2016, a Quinnipiac University Poll in late February found the president's numbers are now underwater, with 54 percent of voters disapproving of the job Trump's done so far and just 42 percent approving. That same poll gave Nelson a narrow lead over Scott, 46 percent to 42 percent. Nelson's approval ratings remained strong and he's winning independents handily. But perhaps most notably Scott's numbers — which the pollster noted have been in negative territory for the past seven years — have rebounded and he's in positive territory with nearly half of all voters approving of the governor. Those new, higher marks give Republicans hope that Scott can overcome any anti-GOP headwinds and are evidence that he's benefiting from positive headlines in the wake of his responses to hurricanes last fall and the Parkland tragedy. And, Scott has something nearly infinite at his disposal — money. Florida is one of the most expensive states in the country to run in, with multiple pricey media markets and a cost of about $3 million per week to run statewide television ads. Nelson had just $8 million in his campaign account at the end of 2017 — an amount which Scott can easily dwarf with simply writing a check. Democrats counter that Nelson is a beloved figure in the state who's served in Congress for four decades and has endured despite political changes in the state (he's the only remaining statewide Democratic elected official) who's crafted a centrist profile. But Republicans argue Nelson hasn't faced a real challenge since he was first elected to the Senate in 2000 and he's unprepared for such a tough test. Last week, Nelson promised to run a strong contest. "When I have an opponent, I assume that they're the toughest opponent," Nelson said at an Orlando event, per the Orlando Sentinel. With a well-funded Scott, "that means I'll run double time like there's no tomorrow," the Democratic senator said. Polls show it will be a tight contest, with Nelson starting with a slight edge. But it also could be the most expensive race in state history. The 2016 race with GOP Sen. Marco Rubio running for re-election topped out at $110.5 million — and that didn't feature a self-funding millionaire. The biggest downside for Democrats, thanks to Scott's deep pockets, is that the state is so expensive — and if Nelson and outside groups are unable to keep pace with the Republican's expected heavy spending — it could complicate their 2018 Senate map. They're defending vulnerable incumbents in much cheaper states, such as North Dakota or Indiana, and may question whether the resources to save one candidate could be better spent to help several others win. Democrats, even in what's shaping up to be a good political year for them, have a very tough Senate map, and are nonetheless eyeing a very narrow and somewhat improbable path to a Senate majority. The cash needed for a Florida Senate race could be a big complication in that equation. Florida's Republican governor, Rick Scott, announced this morning that he is running for U.S. Senate. He’ll be taking on Democrat Bill Nelson for that post. NPR's Greg Allen says Scott's announcement is the latest move in a surprising and polarizing career. GREG ALLEN, BYLINE: Few people in Florida had heard of Rick Scott in 2010 when he announced he was beginning his political career with a run for the state's top office. He ended up spending more than $70 million of his own money on a campaign that came at the right time. It was the beginning of the insurgent Tea Party movement, which embraced Scott as one of its own. After taking office, Scott announced plans to cut $5 billion out of the state budget in front of a crowd of Tea Party supporters. RICK SCOTT: It's a budget that's designed to reduce state spending, lower taxes and hold your government accountable. This is the budget you asked for. ALLEN: In his first year, Scott oversaw big cuts in spending on education, healthcare and the environment. He took aim at government regulations, eliminating an agency that oversaw development statewide. It was all done with one purpose in mind. MAC STIPANOVICH: His thing was jobs, which he's been so consistent about as almost to be one-dimensional in the last eight years. ALLEN: Mac Stipanovich is a longtime Florida Republican political strategist. STIPANOVICH: Tax cuts for business to create jobs. What time is it? Time to create jobs. ALLEN: Florida's economy, like that of the nation, has rebounded during Scott's time in office. Democrats point out, though, that median incomes have declined during that period, while the cost of living has risen. Scott took office as a conservative with tough positions on many issues, urging, for example, a crackdown on immigration. In a state where a fifth of the population is foreign-born, he quickly retreated from that. After opposing expansion of Medicaid under the Affordable Care Act, he reversed himself on that issue not once, but twice. Now, once again, he opposes it. Brian Ballard, a lobbyist and fundraiser with close ties to Scott, says as he's gained experience in office, Scott's positions on many issues have evolved. BRIAN BALLARD: He's a combination of an insurgent mentality but somebody who understands now how government operates, what it means to compromise to make important principles become governing policy. ALLEN: Before he decided to run for governor, Rick Scott made millions in the private sector. In the 1980s, he helped build Columbia/HCA into the nation's largest for-profit hospital chain. Scott left the company amidst a federal investigation. Columbia/HCA eventually pleaded guilty to overcharging the government and paid what was at the time the largest fraud settlement in U.S. history. In his campaigns for governor, opponents attacked Scott for being involved in one of the largest health care fraud cases in history, but the charges never took hold. Democratic strategist Steve Schale says opponents have consistently underrated Scott's political skills. STEVE SCHALE: First of all, this is a guy that spends a lot of money on polling. He has a sense of where the voters are. He is a magician at manipulating the media. As he will say himself, he only says what he wants to be reported. And honestly, he's been lucky. He's run for re-election in two of the most Republican years in the last hundred, and certainly, he's benefited from that, as well. ALLEN: Over the last year, Florida has been hit by a series of events that have tested Scott, including hurricanes Irma and Maria. In February, Scott rushed to Parkland after 17 people were killed in the mass shooting there and pledged action. SCOTT: The violence has to stop. We cannot lose another child in this country to violence in a school. ALLEN: Working with Republican leaders in the Legislature, Scott was able to sign the first gun control legislation passed in Florida in more than two decades. DAN GELBER: I think you've got to look at eight years, though. ALLEN: Dan Gelber, a former Democratic leader in the Legislature, now mayor of Miami Beach, calls passage of the new gun law just a modest step. GELBER: You know, all of these Republican officials, including the governor, have been very beholden to the NRA. They've given them an outsized influence over our state. They've allowed them to create a gun culture and a culture of violence. ALLEN: Gelber and others say there's another part of his legacy Scott may struggle with in a Senate campaign - his close ties to President Trump. Scott was an early Trump supporter, and the president has urged him to run for the Senate. This election, many analysts believe, will in large part be a referendum on the president, one that may turn Rick Scott's close relationship with Trump into a liability. Greg Allen, NPR News, Miami. (SOUNDBITE OF THE SHANGHAI RESTORATION PROJECT SONG, "RABBITUAL") Transcript provided by NPR, Copyright NPR.